New York: General Electric Co reported an 18% rise in quarterly profit that met Wall Street’s expectations, as revenue rose across its big energy, aviation, healthcare and transportation arms. Investors called the early 2012 forecast heartening and noted that GE’s industrial orders -- an important indicator of future revenue -- were up 16% in the quarter. “On the surface it looks like pleasing results. Nothing that is absolutely terrific. The outlook for double-digit earnings growth in 2012 is certainly a positive," said Oliver Pursche, president of Gary Goldberg Financial Services in Suffern, New York. The biggest worry facing investors is what effect Europe’s looking debt crisis may have on GE results next year. “Possible concerns going forward are going to be related to Europe and what impact that may have, not just there but on global growth in general," said Perry Adams, vice president and senior portfolio manager at Huntington Private Financial Group in Traverse City, Michigan. “There’s elevated uncertainty, there is lower consumer confidence, lower business confidence, and that likely should have some impact on global growth, particularly for GE, that may impact industrial margins," he added. The world’s biggest maker of jet engines and electric turbines reported third-quarter earnings attributable to common shareholders of $2.34 billion, or 22 cents per share, compared with $1.98 billion, or 18 cents per share, a year earlier. The results included an 8-cent-per-share charge to buy back the preferred shares the company had sold to Warren Buffett’s Berkshire Hathaway Inc during the financial crisis. Buying back the Buffett stake, which carried a preferred dividend, will boost GE’s annual earnings by 3 cents per share in the coming years. Factoring out one-time items, profit came to 31 cents per share, meeting analysts’ average forecast, according to Thomson Reuters I/B/E/S. Revenue was little changed at $35.37 billion, above the $34.94 analysts had forecast. GE shares rose 5 cents to $16.70 in premarket trading. The company has been counting on its large presence outside the United States, particularly in China, Russia and the Middle East, to offset sluggish demand in its home economy and Europe. 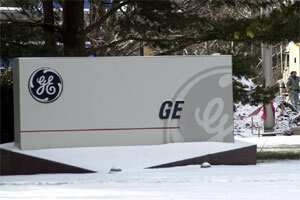 It has also been working since the financial crisis to scale back its GE Capital finance arm. Investors have grown uneasy that Europe’s brewing debt crisis could shake the world financial system once more. But big industrial companies have notched third-quarter results that topped Wall Street’s expectations. Earlier this week, fellow blue-chip United Technologies Corp beat analysts’ forecasts and said it expects profits to rise about 10% next year, despite a tougher economy. GE shares have fallen about 9% so far this year, while the Dow Jones industrial average has declined less than 1%.